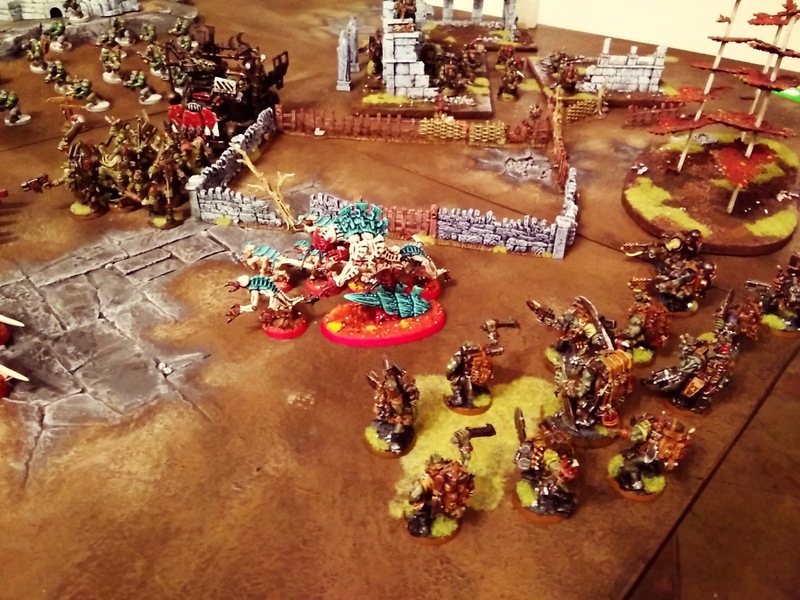 I haven't played a game of 40k since Blog Wars so it was about time I rolled some dice. 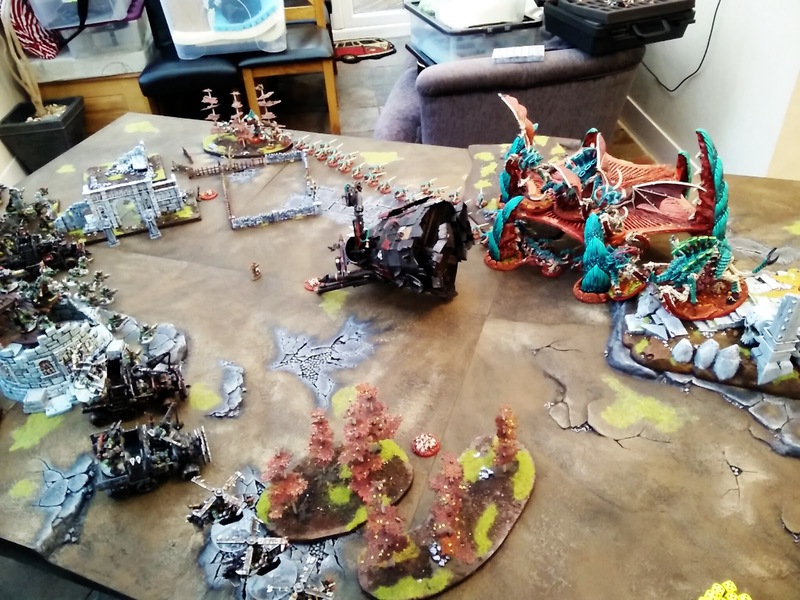 Ben asked me for a game so having heard how his Imperial Guard faced up to Liam's Khorne Space Marines and Super-Heavy Walker I set about ensuring I wouldn't be steam-rolled by his tanks and Imperial Knight Lancer and lo he went and brought Orks to the table! No night fighting, won deployment, opted to deploy second and failed to steal the initiative. a mob of heavy shootaz in the the wizards tower with the Ork Shaman and lastly some Kommandos and Snikrot were lurking in reserve with his flyer. 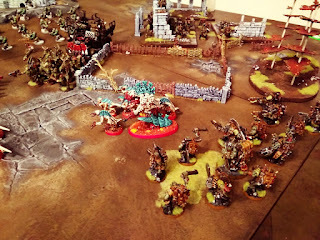 I set up across the board but weighted most of my army on the right [my left flank]. I stretched the Termagants out to my right flank so I could at least try and contest that objective but I had no illusions to capture it without comittign further resources. Even so I positioned the Chidlren of Cryptus on this flank, I didn't think they'd prove to swing the balance in my favour but I couldn't think what else to do with them so thought it was a good a place as any and should I see this side crumble they were fleet enough to retreat out of range and slo with Dominion as a power I could throw in some synapse on this side should I need it. A lot of my heavy hitters were in the middle on the Skyshield but they were going to sweep in from the righ and cut across his lines. Ben went first, moving eveything forwards. He wasn't particularly effective with his shooting, he killed a couple of Genestealers and a couple of Termagants. 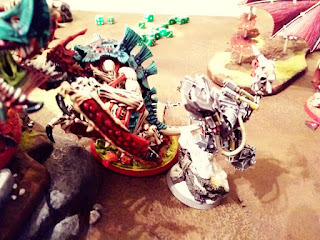 His psychic phase was a bit rubbish too as I had 7 warp charge to dispel his 3. With my go I set about my plan, trying to get efficient overlaps of fire. 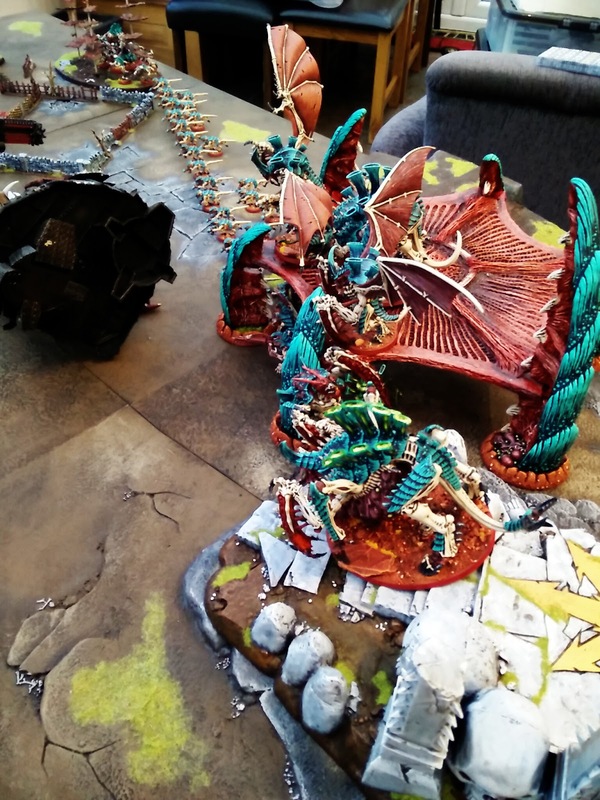 The Flyrants swooped forwards with the Acid Spray Tfex and Carnifex holding on to the chaos shrine. 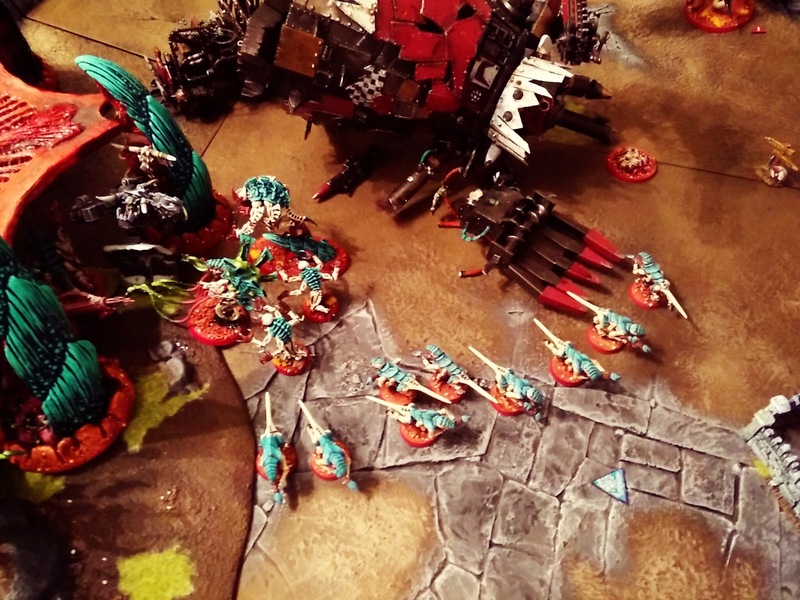 The Flyrant cast Warp Blast and blew up the left Trukk for First Blood but periled in the process, unfotunately lsoing my remaining warp charge which the other Flyrant was going to use for Psychic Scream on the now exposed passengers of the Trukk. Later on Ben remembered ramshackle allows a roll to downgrade penetrating hits to glances, but it still failed and a couple of Orks died in the explosion. I think the Carnifex targetted the Deffkoptas, scoring 3 wounds, the pilots bottled it and immediately flew off the board. The Tfex spewed acid and stinger salvos into the cowering trukk occupants and with added shooting only the warboss survived. Meanwhile on the right flank the Children of Cryptus and Termagants abandoned the woods and headed towards the left flank where all the action was happening. 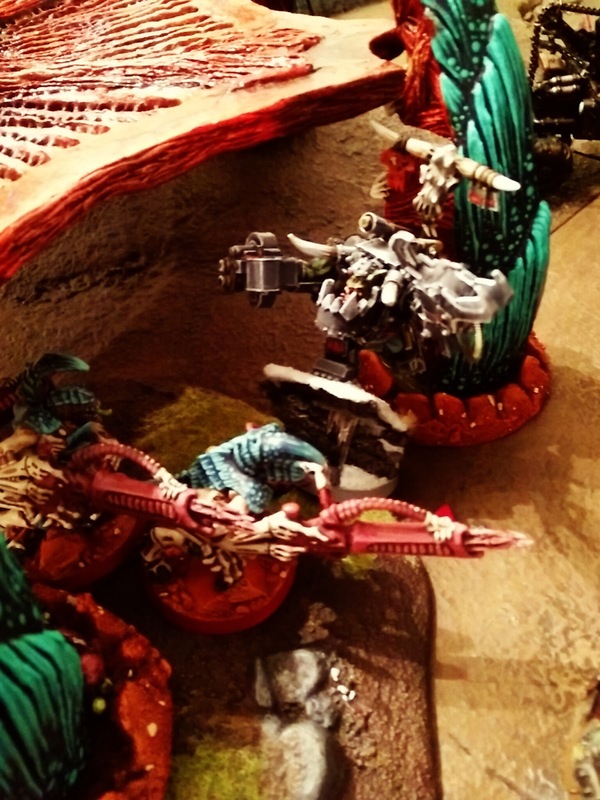 And the Tervigon had spawned out on 8, all of which sat below the Skyshield as a buffer for any assaults. In Ben's turn the Kommandos arrived to threaten the Genestealers. A lot of shooting whittled down the gaunts and left me with the Spawn of Cryptus and three of his brood remaining. One mob disembarked from their trukk. 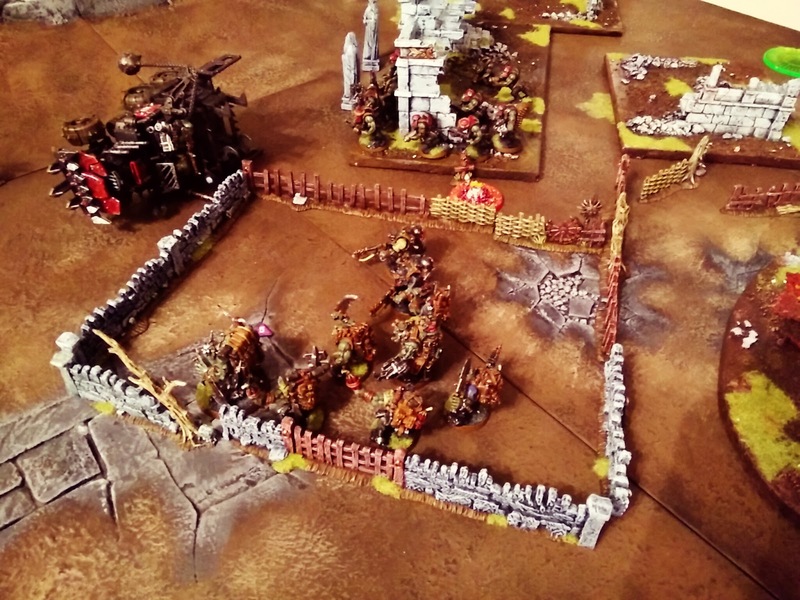 The Orks in the middle of the battlefield tried to take down the Warlord Tyrant but couldn't get past his armour. 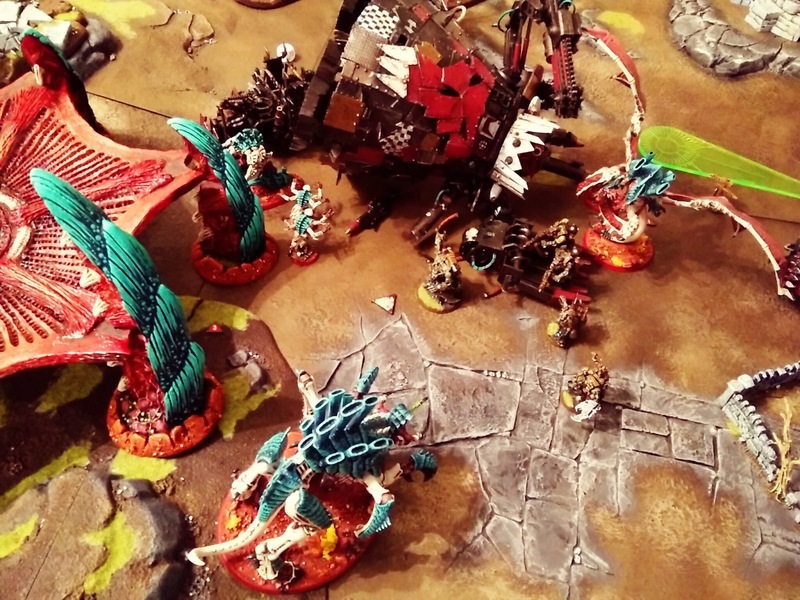 Ghazguhls retinue charged the Spawned Gaunts, I killed a couple but he savaged 7 of the 8 leaving the combat in progress but inevitably a loss waiting to happen for me. 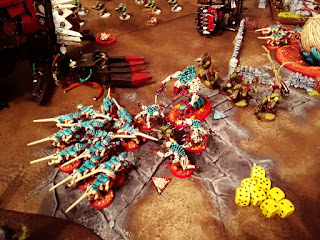 The mob from the trukk charged by big brood of Termagants, once again I managed to kill a few thanks to counter attack but I lost significantly more to their choppas. inevitably chopped him to pieces. 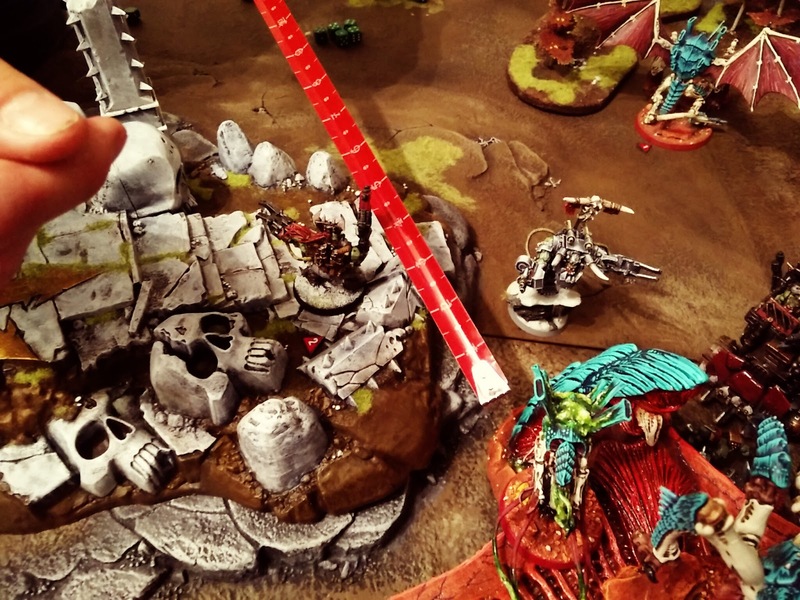 had a special weapon, called the head-lopper or somesuch that on a 6 caused instant death - bye, bye, T-fex. Ben had been markedly despondent after my first turn, the success of a honed army against his thrown together Ork mob had been stark but this went some way to redress the balance of the game. 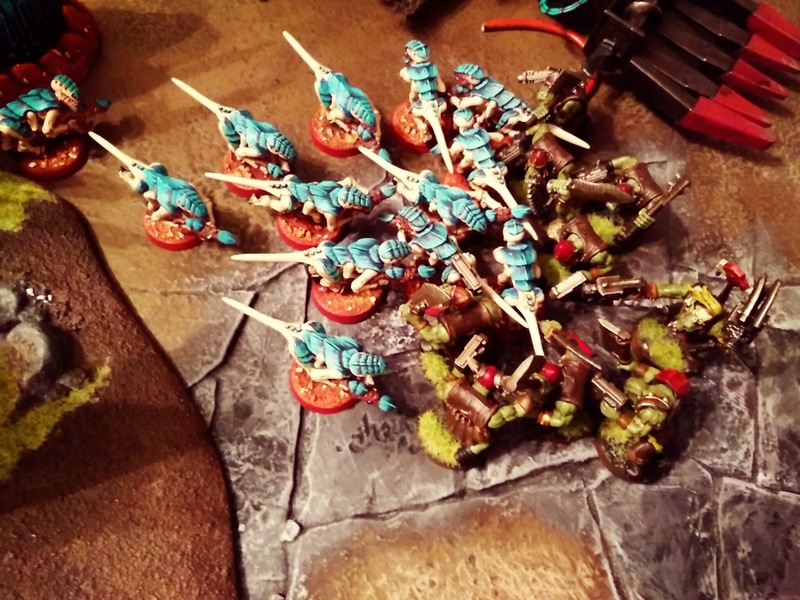 Over one sixth of my army gone in two one sided combats. And Ben would remember the Warboss had a lucky stick and so his second wound would magically heal later on. That was two VPs for killing my Heavy Support. 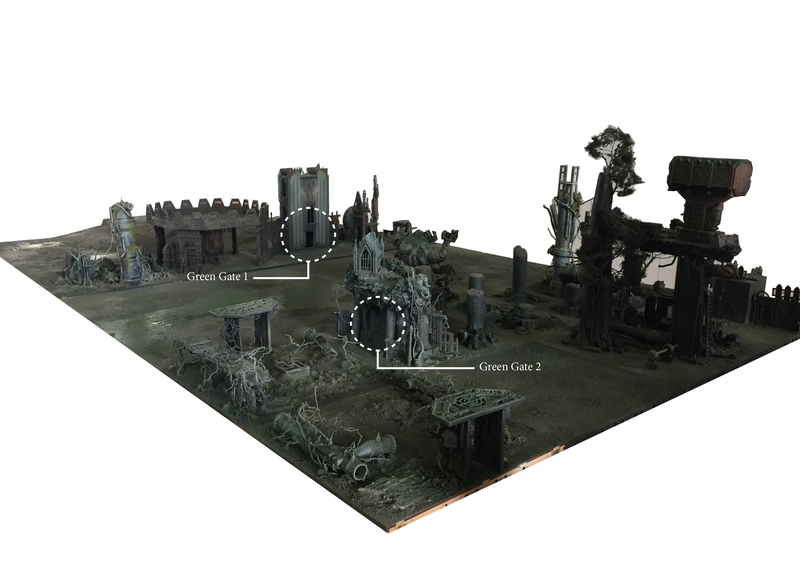 Not so many pics of my second turn, my Spore Pod and Devgaunts dropped into the medieval walled garden. They did some shooting but weren't particularly effective. The Spinefist Rippers deepstruck in the trees with the onjective. Ghazghull was in range of one Ripper base who shot, hit once and wounded once and Ben only went and failed his armour save to suffer the first of it's wounds. The Flyrants swooped across the battlefield shooting at Orks. My Hive guard took out the remaining Trukk as I wanted to deny that mobility. 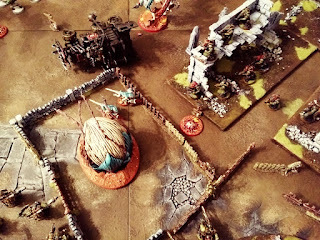 The Spawn of Cryptus and his brood joined the Termagant blob and the deadlock was broken leaving only one Ork in combat. I'd moved everything away from the now legendary Warboss and Ghazgull but the Hive Guard were still in range and he assaulted. I think I wounded him once but lost 3 wounds in the process. 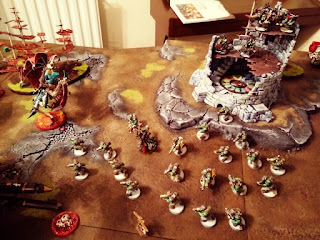 The Orks in the centre of the board managed to wipe out the Rippers, so I lost the objective but still think the wound on Ghazgull was worth it. 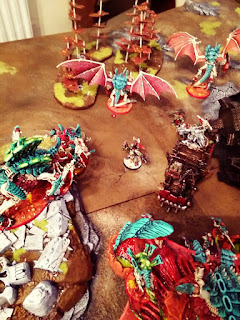 All but 2 of the Devgaunts died, but they stayed put thanks to the Flyrant. 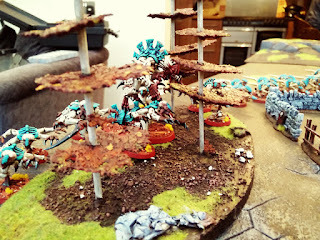 As my turn began I knew that if the Flyrants continued to swoop they'd be out of position to affect the objectives so I gambled and let them glide. 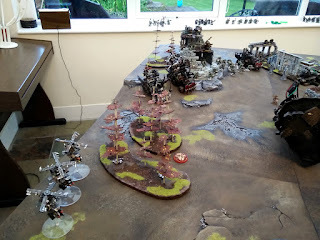 I moved the Warlord tyrant back so he could jump to the objective in my next turn and the other tyrant took up position halfway between the heavy shoota mob and the mob in the centre for psychic scream. 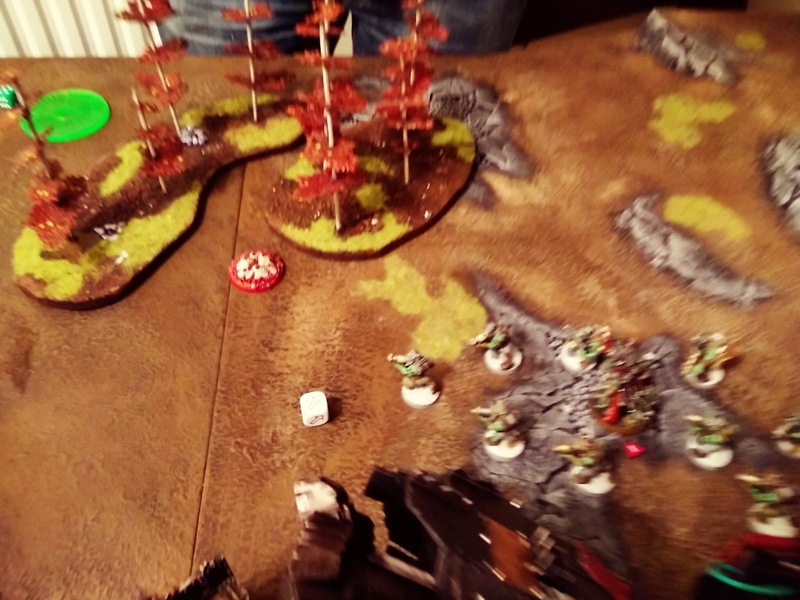 I pulled it off, it killed enough of the shootaz ro force a moral check which the last one on the top floor of the tower failed and then ran 12" [6 down and 6 back] towards his board edge, he wouldn't rally and I'd get a VP as they were Heavys. 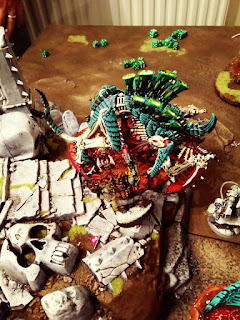 The remaining mob was shot to pieces by Brainleech worms. With the last Ork killed the SChildren of Cryptus headed for Ghazghull. 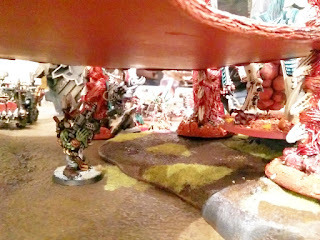 The Kommando went and chopped up my Spore Pod with the Devgaunt also succombing the green horde. Finally, turn four the Flyer arrives and I'd forgotten about it completely and having seen it wipe out a Flyrant in the past I'm suitably worried. Ben manages to put two more wounds on the nearest Flyrant and then I have to make three or four saves to keep it alive and make them all. 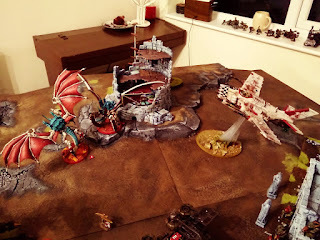 Having failed his previous charge the legendary Warboss has a second crack at the Tervigon who once again sprays it's Miasma Cannon all over it and again AP4 does the business and kills him, much to Ben's annoyance. Given one Flyrant was down to a single wound I had him glide over to the far objective, he needed a 1" run move to secure the objective which is all he got. 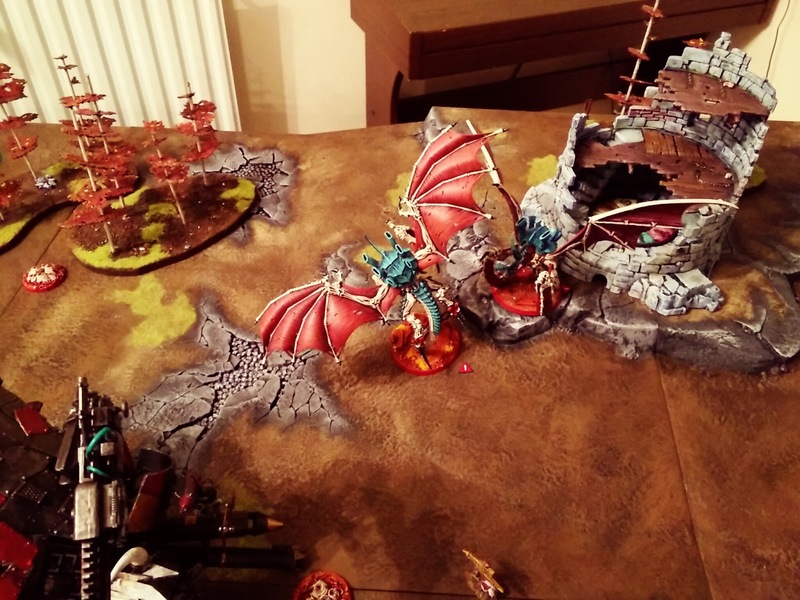 I sent the other Flyrant to secure the middle objective and hopefully be the focus of any other incoming fire. As it was 1am and Ben was not able to secure more than the one objective he had we called it a night, although Ben did have another turn and kill the Flyrant in the woods. So the final score was First Blood, Slay the Warlord, Heavy VP, 1 Objective and 1 VP for taking three wounds off a Lord of War = 7pts to me. Ben had 2 Heavy VPs and 1 objective for 5pts. At the time we forgot about the poitns for LoW wounds so we thought it was 6:5 which given how bad Ben's first turn came about was good going and really points out that sometimes you can claw your way back despite disaster. It felt like a really tactical game though, particularly because a lot of my plans actually played out - the Children of Cryptus starting out on one side and ending up on the other. I'm not sure why that was a good thing but I was impressed that they actually contributed and survived. I was a bit disappointed with the unlucky Tfex but I'm beginning to like him as on paper he's really survivable, obviously not in this case but that torrenting acid spray is pretty cool. The Rippers were pretty pants but they took a wound off Ghazghull so I can't complain and they got shot to pieces which meant the Flyrants went unmolested by a pretty big mob of Orks who could have been lucky, just one wound could have tipped the balance on the Flyrant that was eventually killed by the Ork flyer, in which case the Flyer could have focused on something else. So overall things worked well, nothing was spectacular it was just the all performed to expectation whereas I think Ben had a lot of things that just didn't do what they should have done, although his Warboss and Ghazghull didn't do so bad. 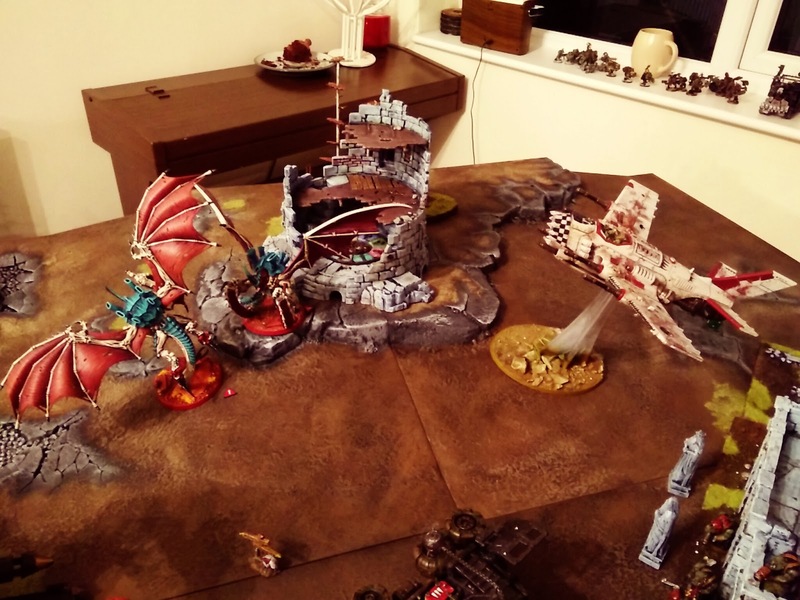 A great game nontheless and it poses a lot of thought for how Ben progresses with his Ork and actually left me really chuffed by my 'nids in general. I'm actually enjoying just putting the big creatures on the table. I need to look at a predominantly MC list for giggles. 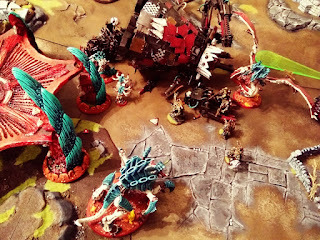 Great game I enjoyed it alot and feel the game is alot better without knights and big lows I appreciate ghazgkull is technically a low but he shouldnt be as gw nerfed him anyway . I did have a tough time turn 1 and your shooting put a serious dent in my force. 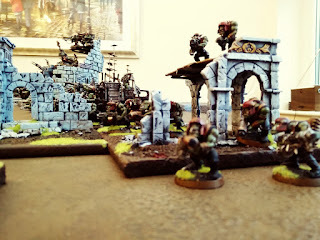 I had decided to give orks a blast as I haven't played with them much since New codex as I have struggled to find much hope for them after studying both the new or codex and ghazgkulls also. 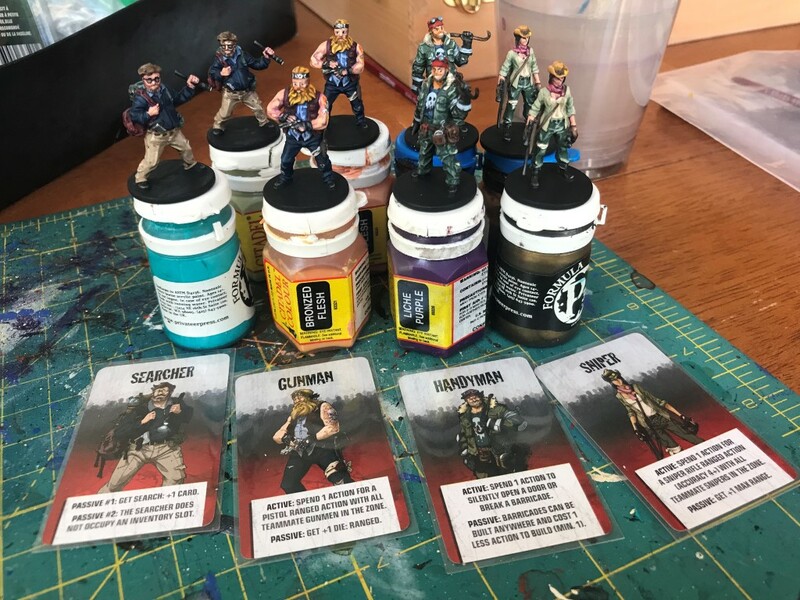 I threw together a force of pretty much all I have but found it slightly wanting my best performers where the kommandos and ghazkhull . I found it tough going against Dave's nids which have been lovingly honed into a really strong force which on its day will give the strongest of armies a game . What I did find and have found for many years playing 40 k is that when ur backs against the wall your slim chances of things happening don't come off whilst your opponent seems to be not only doing what is expected but also taking wounds of models he shouldnt and saving out of his skin . 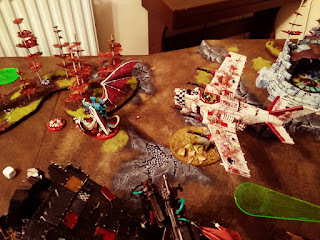 I point to daves rippers taking a wound of ghazkhull which eventually cost him his life and him saving 4 times for his flyrant at such a cruial time . 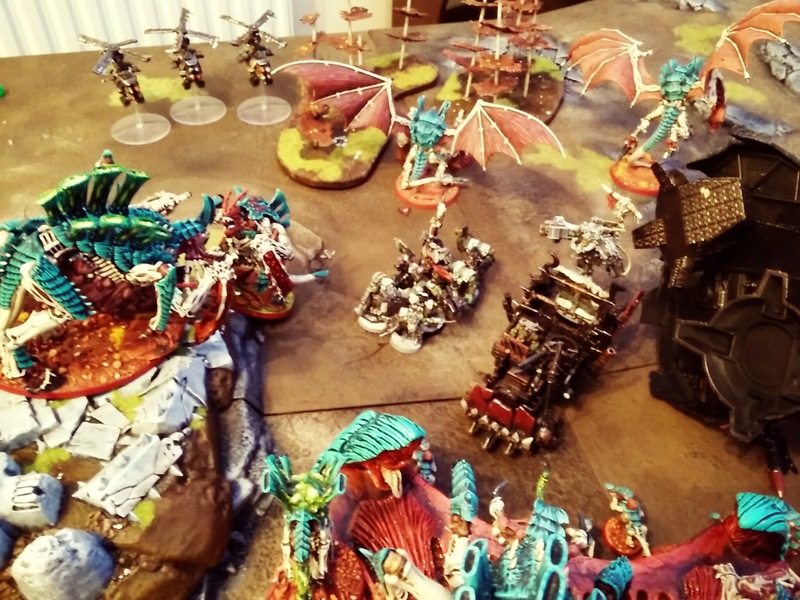 Despite this brilliant game and I'm now back studying ork codex any ideas anyone for a competitive force ? 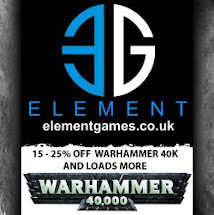 I assume you used ghazzy's waagh earlier? It makes his armor save an invuln (for that turn). I am still said they didn't make ghazzkull into the true monster he should be. His actual height is nearly as tall as a trygon (in the fluff). 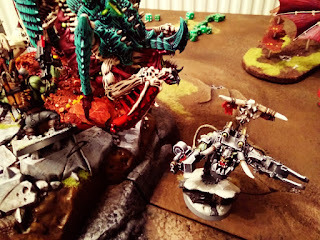 He's a giant beast of an ork! Nice report! A lot of great things are in the new Ork codex. Warbikers are great. 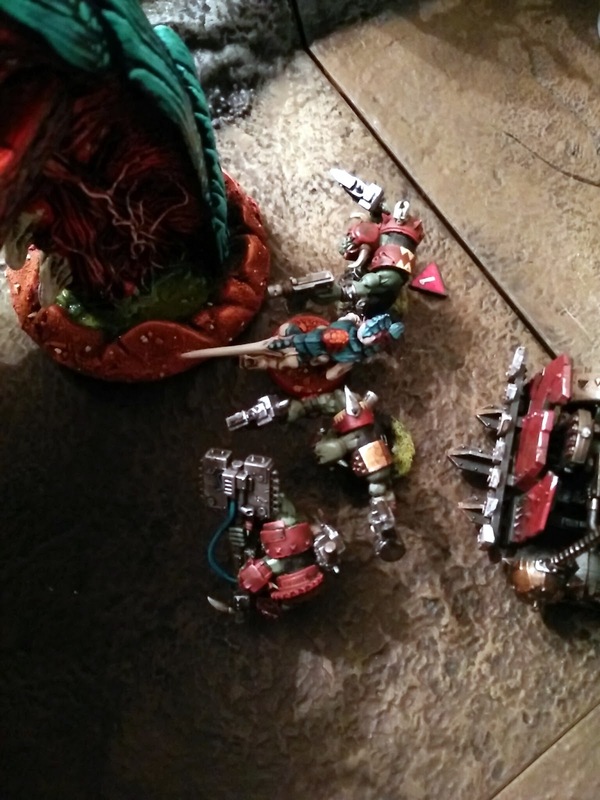 Mek gunz and Tankbustas are really good too now that the Glory Hogz rule was changed. How big was the Loota squad? I have always been impressed with them. 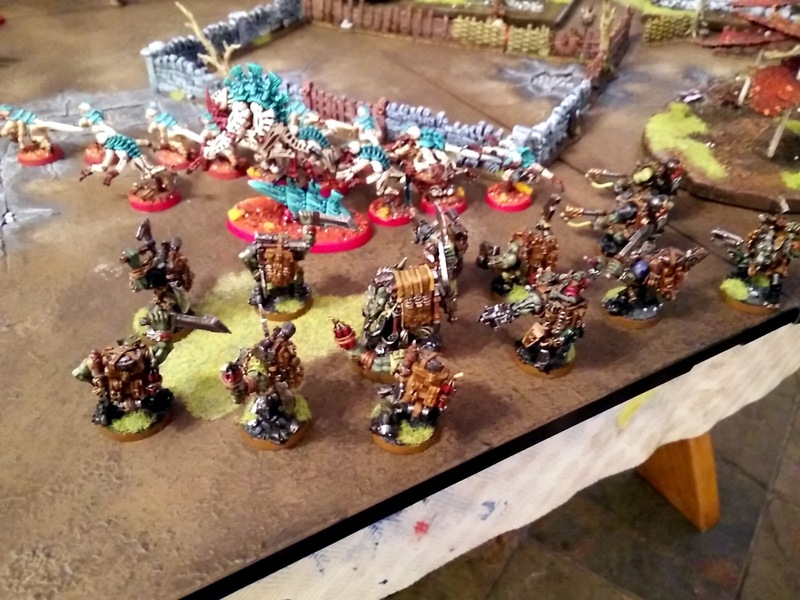 For lootas, put a unit of 15 with a warboss in mega armor, with lucky stix and cybork. Put him so he's in front of the mob. 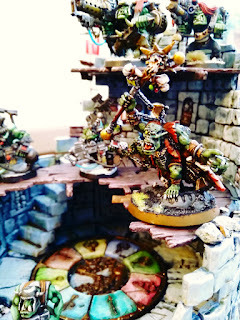 Now they can move and shoot, and any incoming fire goes to the warboss, which he can look out sir, or tank with a rerollable 2+ with a 6+ FNP. 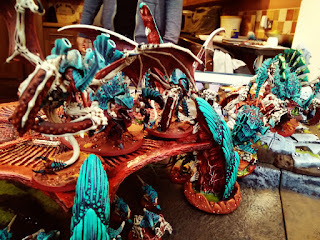 Even without the boss in front, I would run all ten. That's a potential 30 Str 7 shots! 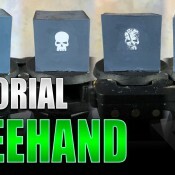 Great for taking out light vehicles and troops. 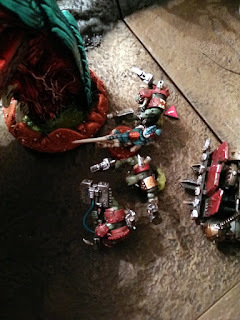 Warboss can't have mega armour anymore or I'm reading it wrong?